Zebras are best known for the distinct black (and sometimes brown) and white striped pattern that covers their bodies. Zebras live exclusively in Africa in a wide variety of habitats. At one time there were several different species of zebras, but now there are only three: the plains, the mountain and the Grevy's. The closest relatives of the zebra are horses and donkeys. Rhinoceros and tapirs are also related, though distantly. Like zebras, horses belong to the Equidae family and are part of the Equus genus. Horses are then divided into various species and subspecies. There are many similarities between the two animals. Their anatomy is very similar, both being hoofed mammals with an odd number of toes. They travel in herds and their movement is described as either walking, trotting, cantering or galloping. In the wild, both horses and zebras graze for food and tend to be very social animals. Their hearing is excellent and they can turn their ears in any direction. Horses, unlike zebra, make good domesticated animals. Most attempts at taming zebras have been unsuccessful due to their unpredictable nature. Another difference between the two animals is in their appearance: zebras are shorter and stockier than most horses, and have a distinctive striped pattern. Asses, commonly known as donkeys, belong to the same genus as horses and zebra, but are in the subgenus Asinus. Donkeys closely resemble zebras in their stocky build. Like the zebra, they also have long ears, short manes that stick up, and solid tails with a small spurt of hair at the end. Unlike zebras, donkeys have a poor flight response to predators and do not run as fast. They do not require as much food as zebras because they are adapted to desert living where food can be scarce. Although stubborn, donkeys make good work animals and have even been known to be affectionate pets. 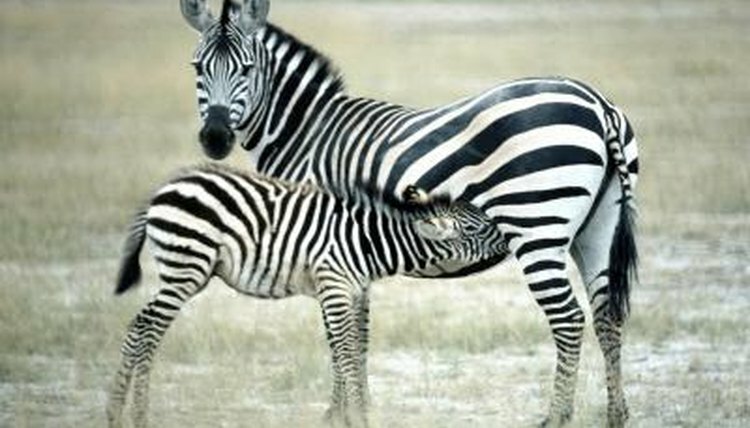 Zebras, on the other hand, remain a mostly wild, undomesticated animal. Although not as closely related to the zebra as the horse and the donkey, the rhinoceros is part of the same order (Perissodactyla) and therefore shares a few similarities. Like zebras, rhinoceros are odd-toed ungulates, hindgut fermenters and lack gallbladders. Both mammals are herbivores. The tapir is also a member of the Perissodactyla order and is the last relative of the zebra among the order category of the scientific classification system. It resembles a large pig, and the only common characteristics it shares with the zebra are the same characteristics the rhinoceros shares with it.